Kniga na kulturnom fronte. 1 & 2-3. 2 vols. Illustrated by L P and Suvorov. Very good copies. Large 8vo, 25x17.5 cm., 49pp., 55pp.. Upper cover to vol. one loose but all present and complete, covers yellowed to vol. II with minor damp damage but very good and complete. 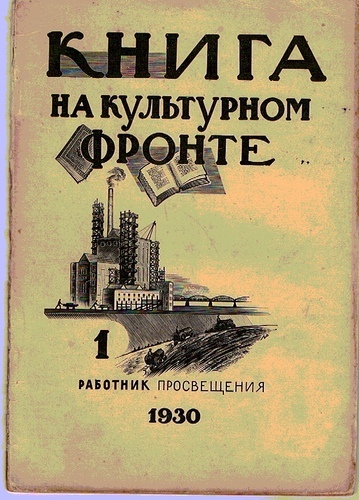 Favorsky-type woodcuts featuring industrial motives to covers. ; Annotated catalogue of recommended reading and study arranged by subject. No. 1: April , 2-3May, June. 5,000 published. Cover design by unknown artist (monogram L.R). Note in first issue that the "Rabotnik Prosveshcheniya" trade mark had changed to a new one, designed by A. A. Suvorov. See Milner 418. c.f. 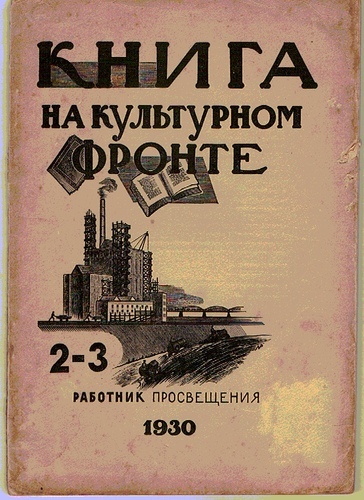 Ilia Trainin's title "Kino na kuturnom fronte", 1928.